There is a wide variety of equipment available to aid intubation. The most common of these will be discussed in this section. In addition, the airway of a patient may be maintained using devices other than endotracheal tubes. Many of these are useful in situations when intubation may be problematic, or used to reduce the morbidity associated with intubation. For preoxygenation prior to general anaesthesia. Provision of oxygen to patients in which supplementation is beneficial e.g. lung injury. Maintenance of gaseous anaesthesia in patients that are not intubated e.g. exotic species, small mammals and short procedures in cats. 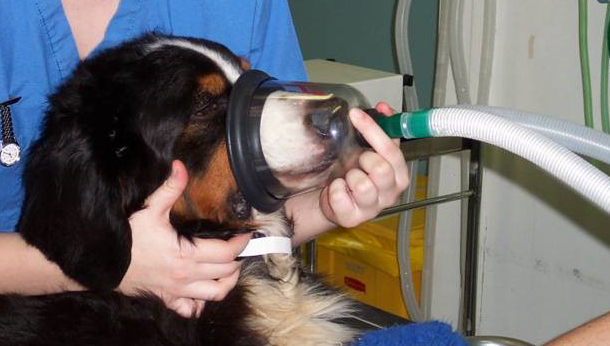 Induction of gaseous anaesthesia in some circumstances (should be avoided where possible). Be transparent so that the patient’s mucous membrane colour can be visualised and vomit or secretions detected. Be of a size suitable for the patient. Have a removable rubber diaphragm so that a good seal can be made. Facial oedema due to compression of vessels. Gastric inflation if the mask is tight fitting. Ocular injury especially in brachycephalics. Poor tolerance – especially if used to administer gaseous anaesthetics. The classic Laryngeal Mask Airway (LMA) has been used for many years in human anaesthesia and has more recently gained limited popularity in veterinary anaesthesia. However, because the LMA is designed for the human larynx, it is not always compatible with veterinary patients’ airway. The LMA consists of an elliptical spoon-shaped mask, which is designed to sit over the larynx rather than passing through like an endotracheal tube. The mask has flexible bars, which prevent the epiglottis from obstructing the tube, and an inflatable rim used to seal the airway device over the larynx. Exiting from the mask is a curved tube or shaft, which at the machine end has a connector identical to that found on an endotracheal tube. The inflatable rim of the mask is connected to an inflation tube and pilot balloon with a self-sealing valve in exactly the same way as an endotracheal tube cuff. A black line runs along the concave curvature of the mask to facilitate orientation once the device is introduced into the mouth. The classic LMA is available in 8 sizes: (1, 1 ½, 2, 2 ½, 3, 4, 5 & 6). As the LMAs are not specific for veterinary patients, it is useful to have more than 1 size available. As for endotracheal tubes, the LMA should be checked prior to placement. Ensure that all disinfectant residues have been removed as these may irritate the larynx. Check the tube for patency and the bars inside the mask for damage. The cuff should be deflated and the syringe removed – it should not re-inflate. Then inflate the cuff fully and leave for 2 minutes – it should remain inflated and the mask should retain its elliptical shape. The cuff should not herniate or look deformed. Immediately prior to placement the cuff should be completely deflated by pressing the mask down on a flat surface whilst withdrawing the air – there should be no wrinkles present. Deflate the cuff completely and lubricate with a water based gel, taking care not to place any lubricant within the bowl of the mask. Position the animal in sternal recumbency with the head extended and the tongue pulled rostrally. Place the tube blindly into the mouth with the black line facing the upper lip. Advance the tube in the midline towards the back of the pharynx until resistance is felt. A directional change may be appreciated as the tip of the mask reaches the wall of the pharynx. Continue to advance the mask in a downward direction until definite resistance is felt. Inflate the cuff of the LMA which will move the device slightly in a rostral direction. Ideally the cuff pressure should be checked with a manometer – 60 cmH2O is recommended in humans. The black line should be checked to ensure that it remains directed towards the upper lip. Capnography should be used to confirm placement and the tube is secured in place as for an endotracheal tube. The LMA may also be used to facilitate blind intubation of the trachea in those patients which have a larynx that is difficult to visualise. An endotracheal tube can be passed through the LMA although the size of passable tube is somewhat limited. Alternatively a stylet, bougie or tube exchange catheter can be passed through the LMA and then an endotracheal tube can be railroaded over the top (see later). Note though that the LMA is not as reliable as a cuffed endotracheal tube in preventing the aspiration of regurgitated stomach contents or oral secretions, and positive pressure ventilation (PPV) may be difficult if a seal has not been achieved. Reusable LMAs are available and are fairly robust. Up to 200 autoclave cycles have been reported. Autoclave temperature up to 135°C are suitable for reusable LMAs. Single use LMAs should not be autoclaved. Reduction in complications associated with endotracheal intubation. Reduced environmental pollution when compared with facemasks. The V-Gel® is the first veterinary, species specific, supraglottic airway device and is available to purchase in the UK. Currently, the device is available for cats and rabbits, and prototypes are being tested for use in dogs and horses. There are 6 sizes of device available for both cats and rabbits. The devices are colour coded: purple for cats, and green for rabbits; this makes it easy to select the correct tube. The development of the V-Gel® is not intended to replace endotracheal tubes, but rather to compliment the array of airway devices available to the veterinary anaesthetist. Its use should be based on appropriate patient selection. The V-Gel® has been designed to reduce the morbidity and potential mortality associated with endotracheal intubation in veterinary patients. The devices are very easy to place and can be re-used following appropriate disinfection and sterilisation. Currently the marketing license recommends no more than 40 autoclave cycles per device. The V-Gel® is made from a unique gel-like material that is shaped to fit the contours of the animal’s pharynx. The gel-like nature improves patient comfort and reduces post-operative discomfort that may be recognised following endotracheal intubation. Breathing system connector identical to that of an endotracheal tube.It is permanently moulded to the device as no shortening of length is necessary. Short shaft which connects the connector to the device itself. Shoulder of the device which provides a definite ‘stop’ point during insertion. A dorsal bump on the shoulder which helps to prevent rotation of the device during insertion and once in position. The V-Gel® for cats incorporates an adjustable dorsal ‘button’ which can be used to increase the pressure of the device over the larynx to improve the seal if necessary. This is inflated by inserting a syringe into the inflation line of the button. A port for attaching a capnograph sampling line. On the ventral surface of the device there is a tongue pressure relief area. The bowl of the device itself has a soft gel cuff surrounding an enlarged airway aperture to provide a seal around the larynx and reduce airway resistance. At the end of the bowl there is a gel tip which occludes the oesophagus and prevents regurgitated material from reaching the airway. Currently, the main disadvantage of the V-Gel® is its cost. Stylets are designed to fit inside an endotracheal tube to facilitate intubation. They are readily available and can be used in all intubations or reserved for the difficult airway. There should be a means of securing the stylet at the machine end of the tube such that the stylet does not protrude beyond the patient end of the tube. This is usually in the form of J-shaped (or hockey stick) bend and this is hooked over the tube connector. They are stiff enough to maintain the desired shape of the tube but also malleable enough to enable the user to alter the curve. Lubrication of the stylet is recommended to facilitate easy removal of the stylet once the tube is in place. Some anaesthetists remove the tube connector when using a stylet to ease the removal following tube placement. Care should be taken when using a stylet as tracheal injury can occur, particularly if the stylet is allowed to protrude beyond the patient end of the tube. Also known as an introducing catheter. Typically it is made from brown-coloured polyurethane and is re-usable. A bougie usually has graduated markings along its length. Its tip is usually bent at an angle (30° – 45°) so that it is easier to pass into the trachea and also prevents it being inserted too far. The shaft of the bougie is hollow and its tips may be cut so that CO2 may be monitored through it confirming correct placement. The bougie is used differently to a stylet in that it is intentionally placed through the larynx and into the trachea, and the tube is then passed over the top – also known as ‘railroading’. It can also be placed inside the endotracheal tube with the angled tip protruding from the patient end prior to placement. It is often utilised in difficult airway situations, especially in those patients where it is difficult to open the mouth. Before use the bougie should be examined for possible fractures and then should be well lubricated. This facilitates the railroading technique of intubation. These devices look similar to a bougie, but are longer and more flexible and have a connector that can be used to attach it to breathing system to provide oxygen during the exchange process. The catheters are used if a tube needs to be changed – e.g. a tube with a suspected tear in the cuff, or in patients intubated for long periods of time. As such, the length of the AEC must be at least twice the length of the tube being changed. Turn off the anaesthetic machine and disconnect the breathing system. Thread the AEC through the existing endotracheal tube after pre-measurement. Alternatively, use the depth markings on the AEC to estimate how far the AEC is in the trachea. Remove the endotracheal tube over the AEC whilst holding the AEC in place. Place a new, lubricated endotracheal tube over the AEC and advance it (much like placing an over the top intravenous catheter). Hold the AEC steady to prevent its advancement further into the airway where it may cause damage. If the new tube meets resistance, try twisting the tube 90°. Check tube placement with capnography if available. Complications associated with the AEC are usually due to inappropriate advancement. The tip of the AEC may perforate a bronchus or the lung itself. Never advance an AEC against resistance. The laryngoscope comes in many shapes and sizes, and the entire range will not be discussed here. The most common and important blades and the technique for use will be described here. Alternative laryngoscopy techniques may be used in difficult intubations – fibreoptic endoscopes may be used to visualise the glottis and then act as a bougie to railroad an endotracheal tube into the trachea. Rigid laryngoscopes are usually manufactured as a separate handle, which contains batteries to power a bulb, and separate interchangeable blades, the selection of which depends on the patient and personal preference of the anaesthetist. The blades are either re-usable or single use. In veterinary practice, even single use blades will be used multiple times. In re-usable blades, the bulb is often located within the blade itself. For single use blades, the bulb is integral to the handle. The bulb is energised once the blade is locked into position on the handle. Handles are usually roughened to improve grip, and come in a variety of shapes and sizes. This author prefers the pen-like handles because they are unobtrusive during intubation and are easy to hold and use. When fitted, the blade usually forms a right angle with the handle, although some handles allow the user to lock the blade into different positions. The blade is described in terms of its base, heel, tongue, flange, web and tip. The base of the blade attaches to the handle itself and is notched to allow it to fit in the horizontal pin of the handle. The tongue or spatula is the main part of the blade and may be straight or curved. It is used to depress the base of the tongue (not the epiglottis) when used for intubation of the trachea. It may also be used to manipulate or move soft tissues (e.g. soft palate) to improve visualisation. The flange is connected to the tongue by the web. The flange is used to guide instruments into the mouth and to preserve the field of view. The flange of a blade may impair access to the larynx in veterinary patients when intubating with the right hand – this arises because humans are intubated from behind, whereby the flange would lie to the left. However, reverse blades are not readily available. The tip is blunt and thick to reduce instrument-associated trauma. Once the skill of using a laryngoscope for intubation has been mastered, the type of blade used actually makes very little difference. Macintosh – this blade is curved and is available in a variety of sizes. When cut in cross section, it has the shape of a reverse Z. There are numerous modifications of the standard Macintosh, which will not be discussed. Miller – a straight blade also available in numerous sizes. Again, there have been a number of modifications made but these will not be discussed. In cross section, the blade forms a C shape. Dogs – the dog can be positioned in sternal, lateral or dorsal recumbency for intubation. However, the technique is easier if the dog remains in sternal recumbency following induction of anaesthesia. An assistant places a length of gauze bandage around the maxilla and upper canines. The head is lifted with the bandage and supporting hand on the scruff. The intubator grasps the tongue using the index and middle fingers of the hand not used to operate the endotracheal tube and pulls it rostrally and ventrally to open the mouth. If the tongue is slippery, use a gauze swab to grasp the tongue. Alternatively, if visualisation is good, the tongue does not need to be grasped at all and this reduces the potential for tongue injury. In the same hand palm the laryngoscope handle and direct the blade into the mouth. Advance the blade so that its tip sits in the vallecula (the space between the base of the tongue and the epiglottis) and push ventrally. This manoeuvre should free the tip of the epiglottis from the soft palate and expose the larynx. If the soft palate is overly long then the tip of the blade, or the endotracheal tube, may be used to manipulate it so that the epiglottis lies ventral to the palate. With the free hand pass the endotracheal tube tip through the arytenoids into the glottis and carefully advance the tube with a slight twisting motion if necessary. Cats – are intubated with a laryngoscope in a similar way to dogs. This author uses a short straight blade for feline intubation. Use the laryngoscope to identify the larynx prior to spraying with lidocaine. Trauma – improper or rough use of the laryngoscope can lead to trauma of the soft tissue structures of the mouth. Teeth may be damaged and bruising of the pharynx and larynx may occur. If the delicate structures of the larynx are damaged, this may lead to a haematoma or oedema resulting in airway obstruction following extubation. Shock or burns – the laryngoscope is an electrical device and malfunctioning may occur. If laryngoscope is left lit for excessive periods of time, the blade may become hot. Aspiration of part of the laryngoscope – e.g. the bulb, or broken tip. The laryngoscope blade should be thoroughly checked prior to use. Haemodynamic alterations – laryngoscopy is a noxious procedure and elevations in heart rate and blood pressure may be noted. Bradycardia may be observed in animals with high resting vagal tone e.g. brachycephalics. Infection – improper cleaning of blades (and handles) between patients, may lead to cross infection. Of note is that the laryngoscope may be used more frequently in those animals presenting with a respiratory disorder and this may be infectious. Recently, there have been alternative airway devices developed, some of which are specific for particular veterinary species. Whilst these devices are not intended to replace endotracheal tubes, it is useful to have access to them for cases in which endotracheal intubation may be challenging or undesirable. Other ancillary equipment is useful to have access to, for cases of difficult intubation. However, there is a degree of skill required when using this equipment and they should not be reserved solely for difficult intubations so that the nurse or veterinary surgeon becomes familiar with their use.